Cannibal Creek Landcare Group, situated in West Gippsland Victoria, has concentrated on two important environmental issues over the last three years – the control of feral animal numbers and the control of environmental weeds. Principally focusing on foxes but also feral deer, rabbits, and Indian Myna birds, the group has worked on ousting blackberry, broom, willows, radiata pines and especially sweet pittosporums along the creek and streams. Garry Burns is the coordinator and organiser of a group of local shooters who are involved in the task of reducing the numbers of foxes, rabbits and deer. Garry has put a great amount of time into liaising with landholders within a three kilometre radius of Mount Cannibal Flora and Fauna Reserve (a site of state significance). These properties are visited at least once a month by a group of competent, licensed shooters who have succeeded in removing over 200 foxes, 300 rabbits and 60 deer from the designated area over the last three years. Indian Myna bird catchers, left to right Ross Cheesewright, Nicole Kuhnell and Alan Forte. Garry estimates that about 70 percent of foxes have been eliminated from the area. The continuation of this programme is important to ensure that this reduction in number is ongoing. The group has been able to receive funding from “Caring for Our Country” and Port Phillip and Western Port Catchment Management Authority via the Cannibal Creek Catchment Biodiversity Project to supplement the cost of the ammunition. Under the same project, Cannibal Creek Landcare has been considered to be part of the release of the new strain of Calicivirus K5 strain in autumn 2017. Control of foxes will then become more important. The problem of Indian myna bird numbers has been addressed through the purchase of three cages and funding promised for another four, plus the use of group member’s cages. 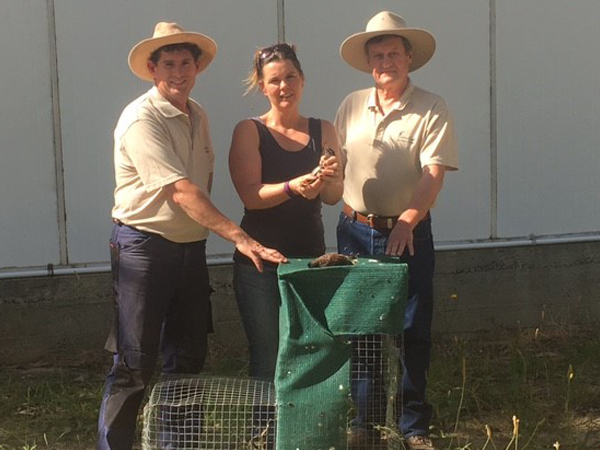 Three members, Ross Cheesewright, Alan Forte and Nicole Kuhnell, have been instrumental in trapping and disposing of the birds and educating other group members and the public on the best way to utilise the traps. These three members alone have accounted for trapping over 600 birds in 2016. Weed control is another major emphasis of a project initiated by Cannibal Creek Landcare Group under the title “Cannibal Creek Catchment Biodiversity Project”. Its aim is to completely eradicate weeds from Cannibal Creek, starting from its source all the way to where it joins the Bunyip River, along with its tributaries. In order to deal effectively with the weed infestation, the amount of funding received equates to the number of volunteer hours done by all the project partners. Cannibal Creek and Bunyip Landcare groups, Western Port Catchment Landcare Network, Friends of Mt Cannibal, Cannibal Creek Reserve Committee, Mt Cannibal Preservation Committee, Cardinia Shire, Cardinia Environmental Coalition, Catchment Management Authority, Melbourne Water and Gumbuya Park are all members of this project. For more information on the group’s activities or to get involved, email cannibalcreeklandcare@gmail.com.